The following is a guest post by professional copywriter and freelance writer Michael Schultheiss, owner of Inkwell Freelance. Imagine if your support staff had no set guidelines for handling a ticket. It would be like you pulled in a group of random people from the street, sat them down at the helpdesk, and expected to see a job well done. 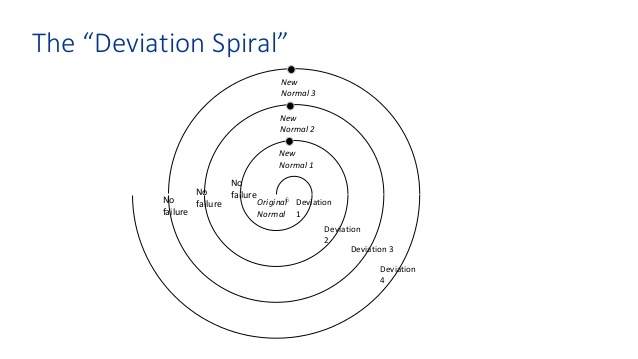 That’s essentially what you’re allowing when you fail to standardize processes. Your company’s operations consist of tasks that must be completed on a daily, weekly, monthly, or yearly basis to ensure that it runs smoothly. But if these processes aren’t standardized, you’re inviting chaos. These could be core processes like dealing with a customer support request, or tasks that recur less often like SSL certificate renewal. Every task — regardless of how often you do it — requires rules that define the scope, quality, and methods to be followed. If you don’t standardize these rules, you can’t have visibility over whether you’re ensuring quality and reducing human error. In short, running your business will be an operational nightmare. Standardization can be applied to any process, any task or procedure that is relevant to the organization: answering the phone, doing payroll, taking down client information, keeping track of tasks, etc. With that in mind, let’s look at the benefits you get with standardized processes. Fundamentally, standardization means that your employees have an established, time-tested process to use. When done well, standardization can decrease ambiguity and guesswork, guarantee quality, boost productivity, and increase employee morale. The first and most obvious benefit of process standardization is that it decreases the potential for ambiguity and guesswork. 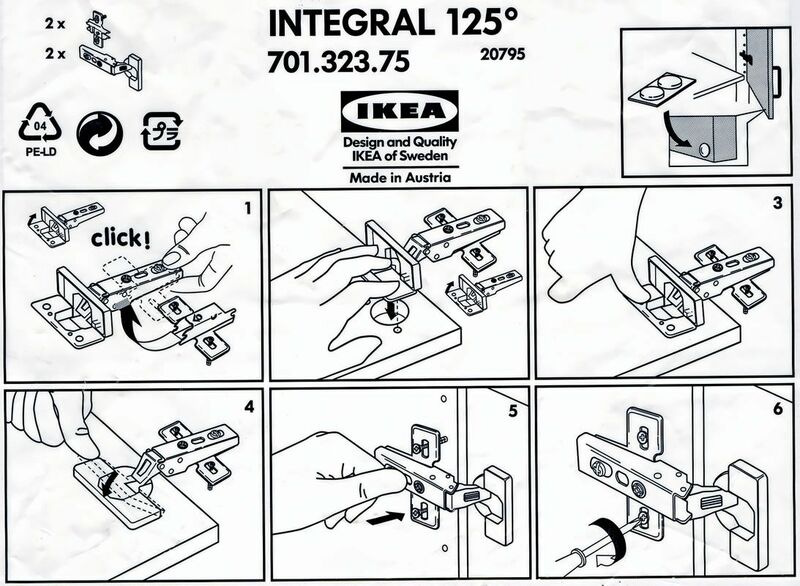 Any complex task is likely to have some gray areas or edge cases. The trouble with this is that time spent on guesswork is time wasted. With a clear set of instructions to work from in order to complete a task, employees will spend less time trying to figure it out and more time actually doing it. Think about the tasks you have had to teach other people. How much time and effort did you spend teaching them to do things that came naturally to you from years of practice? How many times have you had to deal with a mistake that someone made because they guessed, and guessed wrong? In the past, I’ve hired other writers to help me with a variety of projects. What I have found is that it is very challenging to teach other people to perform to the standards I’ve gradually developed — especially if those standards are only in my head, not on (digital) paper. This is where standardization comes in. 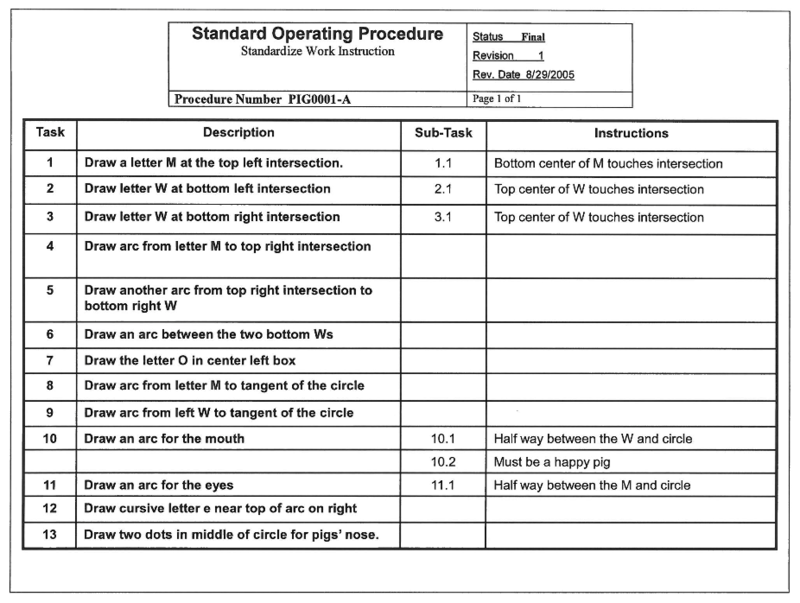 Effective standardization of procedures means that there is one correct way in which to complete a particular task, which is defined in terms of a clear, measurable end result. If a lack of standardization means more ambiguity, one unavoidable consequence of this is going to be less reliability, and less consistent quality. This is because not all approaches to any given task or procedure are created equal: there are better and worse ways to answer the phone, take down important information from a customer, and send status updates to your team. One of the most important ways in which standardization can help to guarantee quality is by minimizing the chances that crucial details will be overlooked. For example, if you have a template for policy and procedure documents, you can use that to reduce the chances that someone will omit crucial information. 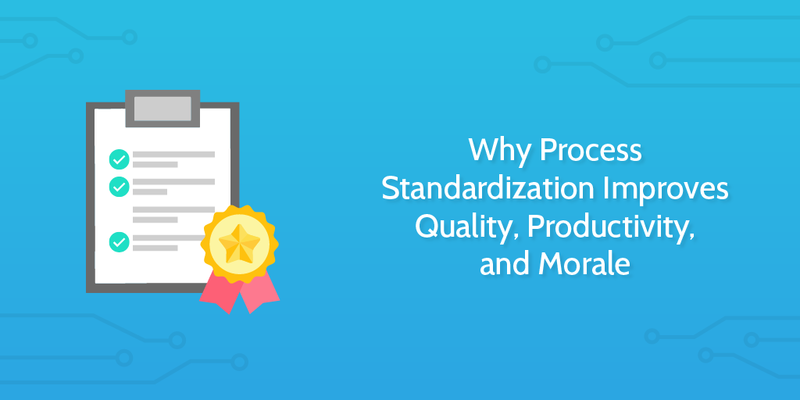 By standardizing the processes your organization depends on — and enforcing those standards — you will be guaranteeing the quality of the finished result. Broadly speaking, standardization is associated with leaner, more functional performance, meaning your organization can cut waste, and do more with the available resources. Standardization promotes productivity by eliminating inefficiency. This is the result of eliminating ambiguity and providing quality control: tasks are completed in a more efficient manner, and there are fewer quality control issues from tasks that were not completed correctly the first time around. Another benefit of eliminating alternative procedures is the reduction of unhealthy competition and conflicts. Let’s say your organization has three different semi-formal systems for keeping track of workflows, each of which has its own constituency within the organization. Three different groups of people, three different systems — the conflicts are inevitable. Even if all three systems are about equal in productivity, trying to coordinate them across your organization will probably lead to competition and conflict between the three different factions. If everyone learns the same way of doing things and sticks to it, it will be easier for teams to work together. This means more productivity by virtue of synergy, and less time wasted trying to communicate across gaps in understanding and practice. To be sure, it’s unlikely that three different systems for keeping track of workflows, or performing any other important task, will be equally efficient. Even if they were, it would still make sense to standardize in order to reduce conflict. The key thing to remember about standardization and employee morale is that standardization will help employees to feel a sense of achievement and pride. Standardization does not have to mean dreary monotony and lack of creativity; it can (and should) mean standards anyone can master, and take pride in honing. As a general rule, everyone wants to know if they are doing a good job or not—and they want to know how to achieve that distinction. Not knowing if one is doing one’s job correctly can be very stressful. Having to apologize for inadequate or incorrect work can be humiliating as well as stressful. If one did not understand performance standards to begin with, it can also be extremely frustrating. If processes are governed by standards that teach employees to do efficient, high-quality work, the employees are more likely to take a sense of ownership and pride in the work that they do. Instead of uncertainty and inefficiency, the employee will have a prescribed way to accomplish their assigned tasks which actually works. The result is likely to be greater employee morale. What this means is that the connection between standards and employee morale is fundamentally about employees being able to take pride in achievement. If the standardized process is efficient, avoids needless frustration, and guides employees to achieve something meaningful and worthwhile, employees will have every reason to take pride in the work they are doing. Saved replies are an effective way to standardize your customer support because it allows you to send the most optimized and helpful message each time, in seconds. Great customer service is the logical outcome of a team with less ambiguity, higher output quality, better productivity, and increased morale. Standardization can address customer service directly through standardized processes for talking with customers and methods for centralizing information. In my own business, for example, I have clients who routinely contract for writing projects which require a series of assignments in five-week blocks. The projects are very deadline-sensitive, so I have developed a series of standardized procedures for notifying them of the completion of each week’s projects. Standardization can also improve customer service indirectly. If your organization is more productive and efficient, the result will be better outcomes for your customers. The more you can produce with your available resources, and the shorter your lead time and the happier you can make those who rely on you and pay for your products and services. Now that we’ve seen some of the benefits of standardization, let’s address the common concerns. Although there are many benefits of standardization, the idea of subjecting processes and procedures to one correct way of doing things may be a cause of alarm for people who are not used to it. Common concerns about standardization generally revolve around the idea that standardization means boredom and loss of individual creativity. By definition, one correct way of doing things means uniformity. For some people, this will inevitably sound monotonous and boring. The key thing to understand here is that by removing ambiguity and establishing a standard by which to evaluate performance, standardized processes can help employees to feel that they are actually accomplishing things at work. It is far more likely that your employees will feel an enhanced sense of accomplishment, not boredom, if you give them standard processes that help them to achieve what they need to get done. When a task is done to the prescribed standard, it’s 100% done. And checking off boxes gives us a welcome hit of dopamine! A related concern is the idea that if you standardize crucial processes in your company, the result will be a workplace that does not promote innovation and creativity. The essential fear here is that standardization means an organizational culture that leeches away all individual thinking and new ideas, replacing vibrant diversity with a monoculture mentality. Here it is important to not conflate standardization with a lack of innovation. Again, standardization is the elimination of alternatives which are inefficient and conducive to conflict. By eliminating inefficiency and needless conflict in your organization, you can help everyone to free themselves from needless wastes of their time and energy to focus on innovation in areas in which it really matters. The irony here is that in fact, standardization is good for innovation. By standardizing processes, you will be streamlining operations in a way that helps everyone to do more and be more effective team members. And of course, if someone in the organization discovers a way to improve a standardized process, the organization can investigate and possibly adopt it. There is no reason a standardized process cannot be changed over time if circumstance, experience, and innovation indicate that it is indeed time for a change. There are a number of ways in which Process Street can help you to standardize processes, eliminate inefficiency, increase quality and do more of what you do best. Process Street provides templates for creating structured company procedure documents. Whether you are looking to prepare a policy document, an operations manual, or a reference guide, prepare paperwork or prepare an employee’s workstation, Process Street templates can provide you with the basis for creating a structured document in seconds. You can create your own templates, or choose from any of hundreds of different templates in Process Street’s library. 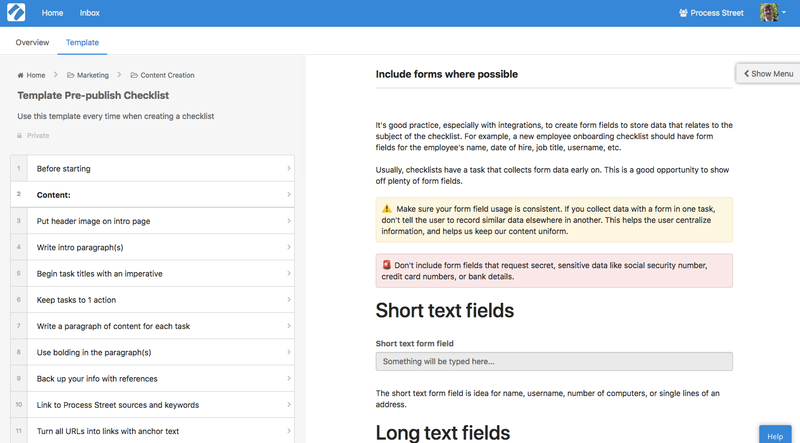 With Process Street templates, you can standardize any number of workplace tasks in a way that will save a great deal of time whenever you have to do them. Some of the tasks in your organization, such as new client intake, employee onboarding, and new content promotion, will need to occur at more-or-less random times. You can use Process Street to create “trigger-based workflows” that allow you to track your progress, effectively automating the procedure so you don’t have to feel like you’re reinventing the wheel each time. And, the more work you can give to a machine, the more work you can be sure is being done consistently and predictably. 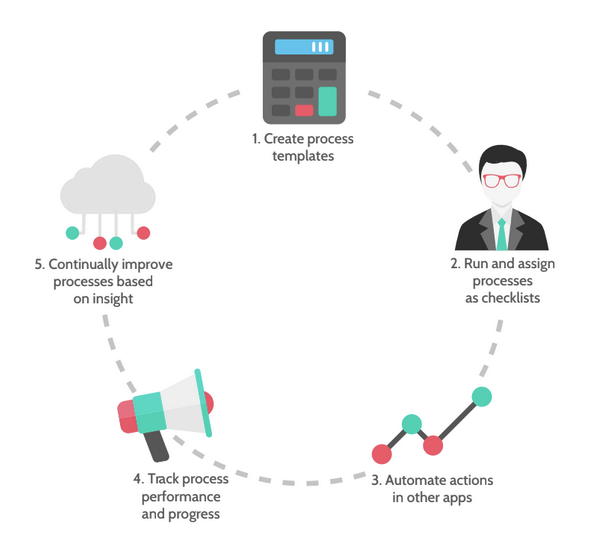 Learn more about setting up business process automation in this guide. Some processes in your organization will need to happen at predictable times: monthly newsletters, onboarding, and performance reviews are common examples. With Process Street, you can easily create standardized process templates and schedule them to be run at whatever interval they need to occur, ensuring your team always know what to do next. If you’d like to standardize your operations, improve productivity, and boost morale, sign up for a free Process Street account today.